I think we can safely credit BMW with popularizing the Adventure Touring or Enduro styling movement way back in 1980. I’m not saying that BMW started the fad; in fact, this type of motorcycle, which is a sort of two-wheel equivalent of an SUV, has one of the oldest legacies in the sport. Dual-purpose motorcycles trace their history back through motocross, Enduro and even the International Six Days Trial. 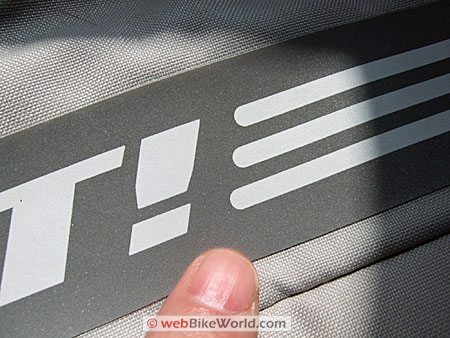 The ISDT is the Grandaddy of them all; it started in the very early 1900’s when the vast majority of road surfaces around the world were not paved and every bike was “dual-purpose”. Or more! But it really wasn’t until the R80GS was released in 1980 by BMW (which ironically was a company that until very recently was known for some of the most conservative designs in motorcycling), that the modern Adventure Touring movement was born. Not that anyone truly understood what was happening at the time because it took almost two decades for the concept to spread beyond a very small band of aficionados. Now it’s 2007 and we have hugely popular motorcycles like the R1200GS and its variants, selling 31,168 copies in 2006 that, irony again, have much to do with the saving of BMW Motorrad as a viable company. Of course, the market is still tiny compared to the number of Sportbikes sold worldwide, but U.S. sales figures for 2006 prove that the “Dual Sport” segment is by far the fastest growing segment of the sport. It has a growth rate of 19% compared to a growth of only 5.4% in the “Street” category. The wimpy 1.3% growth overall in the 2006 motorcycle market in the U.S. would have been in the negatives were it not for this big pop in dual-sport sales. My prediction is that this segment has more growth left. As motorcyclists mature and as Sportbike insurance costs skyrocket, many more riders will find the “sit up and beg” riding position with those huge tiller handlebars as the most comfortable way to go, while still providing that dose of style that motorcyclists crave. The popularity of the new Triumph Tiger (which is about as far from the original AT concept as you can get) and the newly redesigned Kawasaki KLR650 are a portend of more to come. Part of the allure of Adventure Touring can surely be attributed to the fantasy of owning equipment that’s ready, willing and able to carry the rider around the world at a moment’s notice. Only the best equipment and accessories will do in this arena, and plenty of it, which means more stuff to lust after. Of course, the aftermarket has responded, with plenty of “farkels” (aka “farkle”: function + sparkle = farkel) available for which the Adventure Touring owner is duty-bound to shed tons o’ shekels. UPDATE: November, 2009 – The REV’IT! Off Track Jacket and Dakar Pants have now been replaced by the new REV’IT! Sand Jacket and REV’IT! Sand Pants combo for 2010! Right — so there’s a support system in place for preparing an Adventure Touring motorcycle to tackle the Changthang Plateau. (Although as we’ve seen in the wonderful videos like “Riding Solo to the Top of the World” or “The Last Hurrah” that just as much fun can be had on beat-up old street bikes). Well, if you want to go bare bones, you always have the classic motocross helmet and a Barbour International jacket, but it was BMW again that jump-started the market for Enduro-styled clothing that is both functional and stylish. 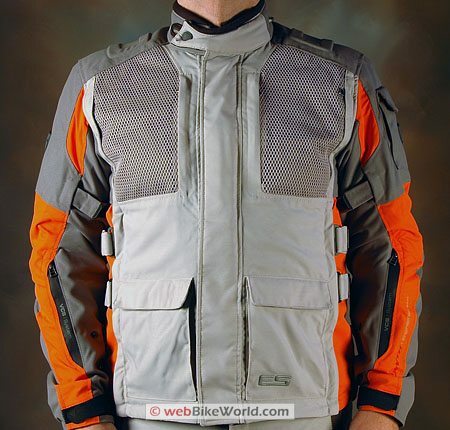 There are probably one or two other motorcycle clothing manufacturers that can lay claim to apparel geared for this market. But my guess is that REV’IT! has what is arguably the largest selection of what could be called Adventure Touring or Enduro styled clothing available today — and that includes BMW. 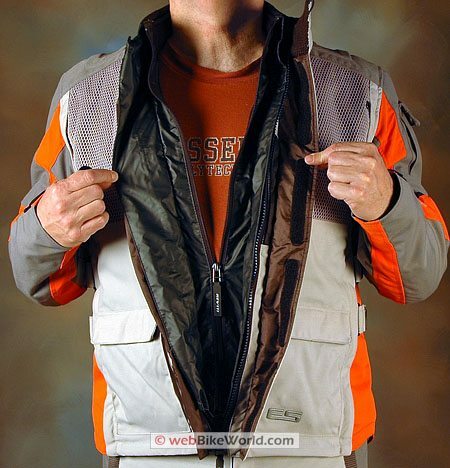 I first inspected the Off Track jacket and Dakar pants at the 2007 Powersports Dealer Expo in Indianapolis back in February and I was impressed with the styling, the functionality and, of course, the typical REV’IT! quality. The Off Track jacket and the matching Dakar pants (I’m not sure why the pants and jacket don’t use the same name) have a snug fit by design. The size large jacket is a perfect fit on my 44″ chest with my 34″ arm length, so based on this one example, I’d say that the jacket sizes run true to expectations. I like the styling of the Off Track jacket, although I’m sure the REV’IT! 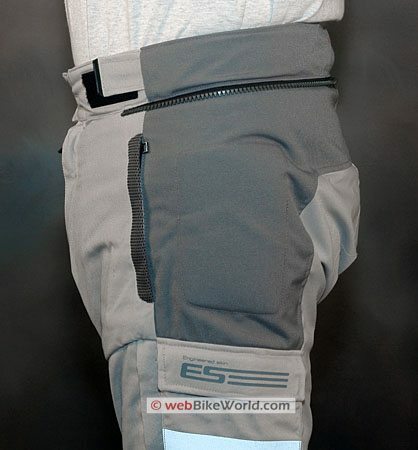 folks will cringe when I say it’s somewhat derivative of BMW’s Enduro clothing. The jacket has a 5/8 length, giving it a slightly shorter hem than might be found on a typical 3/4-length jacket. 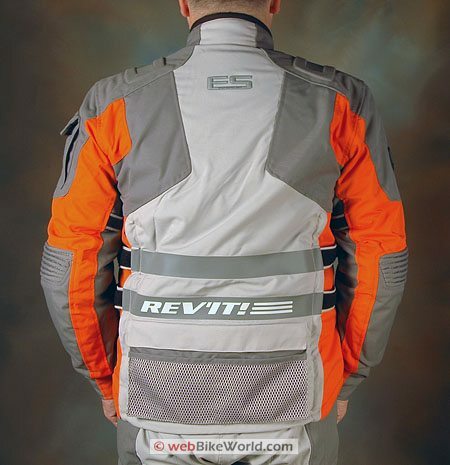 This helps the Off Track feel less confining than a 3/4-length jacket and provides a greater range of movement for either Touring or Sportbike riding positions, while still providing good coverage. The jacket is made from “Kodra” fabric, which is a type of very tough Nylon, similar to Cordura. Kodra has recently become popular for use in both motorcycle and technical outdoor gear. The Off Track jacket is a sort of stone gray color with available red, blue, yellow or orange accents, and this gives it a nice combination of visibility and that you’ll-know-it-when-you-see-it Enduro style. The fabric has a soft hand, or feel, which also makes the jacket immediately comfortable to wear. It may not be obvious in the photographs below, but the construction of the jacket and the method in which the patterns and sections of fabric have been designed and sewn together is very impressive. Also, it’s obviously different (and better) than your typical cheap “off the rack” motorcycle jacket. But in the typical REV’IT! method of combining technology with style, the fabric patterns aren’t just thrown together to look cool; everything is functional, having been designed to help make the jacket fit correctly and feel comfortable. Interior with the windproof and waterproof Hydratex liner. The Off Track jacket has some unique features. Foremost are the removable side panels, illustrated in the photos below. The colored panels under the arms on either side are removable via zippers along either side and a strip of Velcro along the top. Once removed, they expose a heavy mesh that provides good cooling air flow (when the windproof and waterproof internal liner is removed). The underarm area seems to be a good location to allow cool air to flow in without compromising the front and rear protective qualities of the jacket, so the light color and good air flow make the Off Track jacket a decent warm-weather choice. Another interesting feature is the use of large mesh pockets, which are located on either side at the upper chest. The mesh used on these pockets has a wide and open weave and the pockets are accessed by the vertical zippers located on the inside, nearer to the centerline of the jacket. 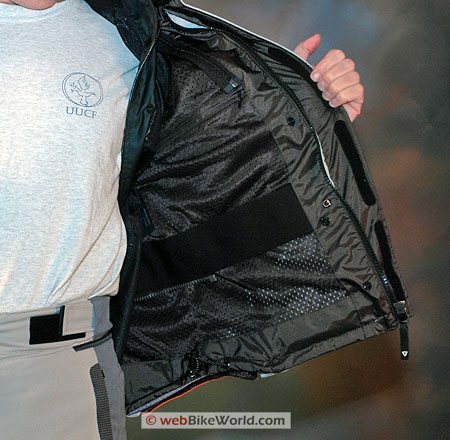 These mesh pockets could come in handy for drying wet gloves or a small towel while on the go. 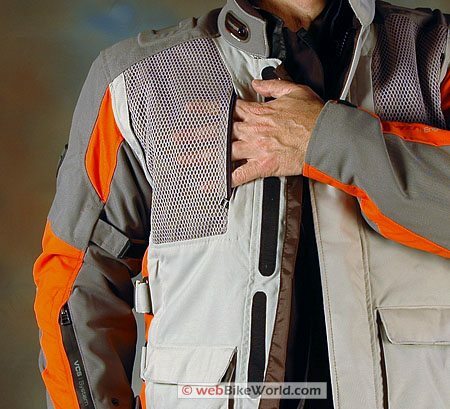 The mesh pockets also have a small vertical zipper at the outer edge near the arm, which open short air vents that will flow air into the jacket when the inner liner is removed. More cooling is provided by vents located at the forearm towards the front, which use the waterproof zipper pioneered by REV’IT! a few years ago. These zippers are very high-tech and also pretty cool looking and they probably don’t come cheap. The Off Track jacket also features several adjustments to allow a snug fit, which is important when riding through the brush to prevent any loose fabric from catching. Two large adjustment straps are located on each side over the removable panels and the arms of the jacket have an upper adjustment strap and a lower snap adjustment to snug up that area if desired. 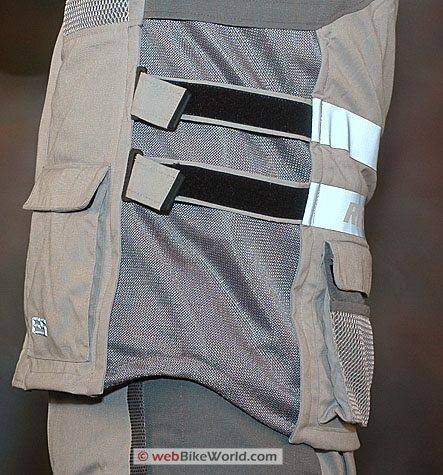 In addition to two waterproof cargo patch pockets at the waist in front, a large horizontal pocket is located on the rear of the jacket. It uses a double seal flap with a Velcro closure and it includes a wide mesh outer pocket across the bottom, which is split into two separate sections down the middle. Two large reflective stripes appear across the lower back section of the jacket, along with reflective patches on the shoulders and other areas. These are the new flat sealed, seamless fabrics that are being used on other REV’IT! clothing (see photo below). Wait until you see their new Infinity one-piece suit, which uses more flat sealing and a super-high-tech nanotechnology coated fabric and many sealed seams, which give the garment a very sleek look! The Off Track jacket also has the same REV’IT! waterproof and windproof Hydratex membrane removable liner that’s used in other REV’IT! jackets, which gives the Off Track a nearly four-season functionality. (Editor’s Note: This is an update from the original version of this article, which incorrectly stated that the jacket does not come with an insulating liner). The Hydratex liner and the jacket itself have chest pockets. The liner has metal snaps for attachment to the jacket and there’s a section of elastic sewn into the sleeve cuffs to keep out wind and rain. The jacket includes CE-approved “ProLife” armor in the elbows and shoulders, along with Temperfoam back padding. A hard armor back protector is available as an option. The Off Track jacket includes both a full-length and short zipper which allow it to be attached to the Dakar pants or other REV’IT! pants. These zippers are attached to a section of stretch fabric, which allows flexibility when the jacket and pants are connected. This is a comfortable jacket with styling that’s a combination of function and coolness that makes it a success in the Adventure Touring/Enduro market. My feeling is that it’s one of those rare jackets that immediately feels broken in and will probably last for a long time, providing excellent service. 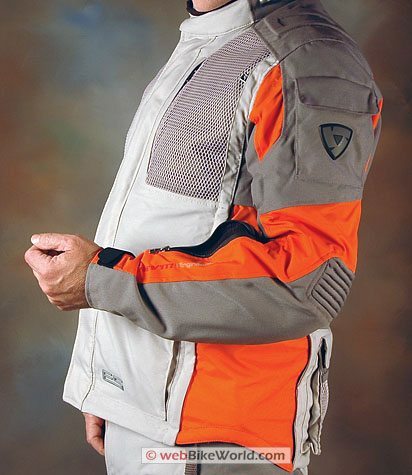 This jacket would look perfect with an R1200GS, a KTM 990 Adventure or a new KLR650! It’s become apparent over the last few years that motorcycle clothing manufacturers do not consider my body shape — that is, my leg length — to fit their definition of “normal” proportions. My femur (“thigh bone”) is apparently shorter than it should be for the length of my leg, and the results are that most of the knee armor in what should be the correct size pants ends up located down on my shins. I have a hard time believing that I’m the only motorcyclist with this problem. But the only motorcycle pants of any type or brand that I can honestly say fit me exactly right are Triumph’s leather “Classic Jeans II“, because the knee armor on those pants is perfectly located. REV’IT! has greatly expanded (pardon the pun) the available sizing range for most of their clothing and the Dakar pants (and most of their other pants) are available in short, regular and long lengths. The Dakar pants are available in waist sizes ranging from S to 2XL. REV’IT! originally sent a size large Dakar pants in the short length, figuring that the knee armor would fit. 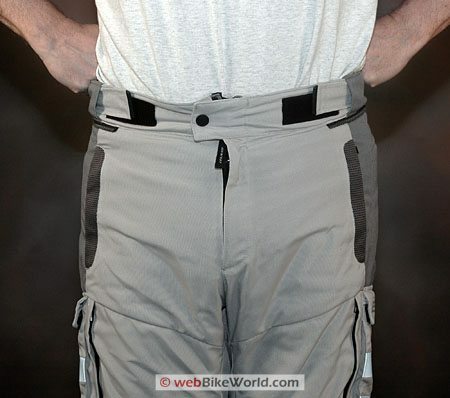 The leg length of the size large, short length pants is just about 30″, but motorcycle pants need a couple of inches of length at the cuff to account for the extra room needed when the legs are bent while riding. Thus the short length would be fine for me as a street pant, they were too short for riding. The knee armor in the short length is located just about right though, but the waist on the size large felt like it was closer to 34″ than 36″ with the standard windproof and waterproof removable Hydratex liner plus the insulating liner installed. So I asked for a size XL, also in the short length, as a replacement. These have what I believe to be the correct 36″ waist when both liners are installed, but because they’re short length instead of regular, they’re still only 30” long so they also ride up on my lower legs a bit too much for riding. I may eventually try a size XL waist in the regular length, which I bet will fit everywhere other than with the knee armor. This will mean that I’ll have to forego the REV’IT! supplied armor and wear my Bohn “Cool Air” armored underwear, which perfectly locates the knee, shin, hip and coccyx armor on my lower unit. Since I have to do this with most motorcycle pants anyway, I’m used to it and I’ve found the Bohn product to be comfortable and at least I know the armor will stay in place. This problem with fit is apparently rare and related to my body shape, so it’s not a condemnation of the REV’IT! gear, but I’m mentioning it so that others are aware of the availability of the short, regular and long lengths. We’ve mentioned this before, but most American motorcycle riders purchase motorcycle apparel that looks at least one or two sizes too large. Don’t believe me? Take a look around the next time you’re at a motorcycle event and you’ll see what I mean. The problem is that although loose clothing may feel comfortable, the loose fit can prevent the armor, padding or abrasion resistant materials from staying in place during a crash. Loose clothing can twist or catch on something as the rider falls or slides, potentially causing more damage than might otherwise be the case. But there’s a difference between clothing that’s just snug or tight and clothing that fits correctly. We’ve found that in most cases you’ll get what you pay for; that is, lower-priced motorcycle clothing is almost never really designed to truly fit. Sure, it comes in small, medium or large. But low price usually means you’re not getting the time and effort that goes into the correct fabric patterns and materials. The piecing together of fabric sections that fit the body and add the most protection, plus the correct methods of stitching and the darts and all those other little apparel construction tricks make the difference between looking good and being good. REV’IT! motorcycle clothing is normally tailored to fit more closely to the rider’s body than other brands, but I think the Dakar pants have a slim fit even by REV’IT! standards. Anyway, after a couple of rides I’ve become accustomed to the fit of the Dakar pants and I can now honestly say that I like the feeling of less bulk. This would probably be an advantage in the outback, to prevent branches, rocks and what have you catching on the pants as you’re zooming by. The relative softness of the Kodra fabric and the cut of the pants also helps in this regard. So I’d say that the Dakar pants fit more like a pair of “classic” tailored jeans than like a pair of bulky motorcycle pants. This may either be a plus or a minus, depending on your point of view. I mentioned above that the Dakar pants have the standard REV’IT! Hydratex windproof and waterproof liner. The Dakar pants also include a thermal liner and both liners use full-length zippers to attach to the pants at both the waist and and at the leg cuffs. The full-length zipper attachment is obviously much more expensive and time-consuming to manufacture, but it provides a much nicer “solid” feel to the pants. The full-circumference zippers at the leg cuffs are an especially welcome surprise. Most pants usually have a couple of snaps to hold the liner, which either come loose, cause the liner to bunch up or even pull loose when entering or removing the pants. The Dakar pants have two vertical “slash” hip pockets, one on either side at the waist, closed with a zipper that opens from bottom to top. The zippers have the typical REV’IT! metal wire pulls, but they can be hard to grab when wearing gloves…although I don’t suppose you’d be entering the pockets wearing gloves anyway. The outer covering of the pockets use a type of rubbery-grippy fabric that looks cool and helps protect the zipper pull from scratching the paint. The pants also have a patch cargo pocket on the outside of either leg. Each pocket is covered with two strips of the same flush sealed reflective striping used on the jacket. Just on the inside of the patch pocket is a short 5″ zipper that opens a vent. The vent opening faces forward, but since it’s located on the upper thigh, it doesn’t seem to provide much air flow. Note that both liners would have to be removed for the air to flow through anyway. 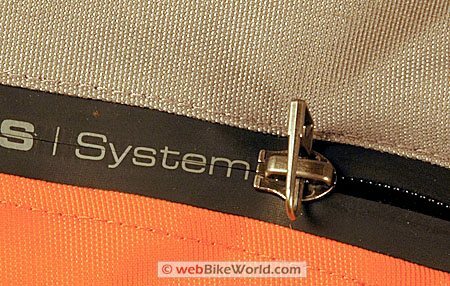 The fly zipper has a large pull, which makes it easy to operate, but the pull sticks out of the top of the fly due to the short fabric flap that covers the zipper. The pants fasten at the top with only a single button snap; I wish they included an additional metal hook. The Dakar pants have tab adjusters at the waist but since the waist itself is solid fabric, the adjusters can only be used to make the waist smaller, not larger. 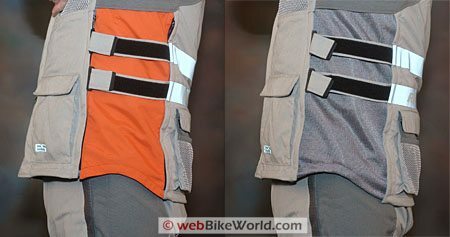 I’d really like to see elastic used in the waist of motorcycle pants or they should have some feature that allows 2″ to 3″ of true adjustment either way. This would help fit more individuals and could also theoretically reduce return costs for the manufacturer if the garment had a wider range that would fit more riders. The pants have both a full-length and short zipper to attach to the Off Track jacket and other REV’IT! jackets. And the inner thighs are covered with leather panels, which work very nicely to help the rider keep a grip on the tank with the legs. The knees have removable CE-approved ProLife armor and Temperfoam padding is used in the hips. The Dakar pants are available in the gray and black color shown here, in sizes S to XL in short and regular lengths and S to XXL in the long length. The Dakar pants make a perfect match for the Off Track jacket. The expanded size range, with Short, Regular and Long lengths should help the pants fit more owners. Although the pants fit tighter than most, they’re flexible enough to be comfortable. Neither the jacket nor the pants are perforated, when the liners are removed they make a decent warm-weather riding outfit, especially with the lighter colors. REV’IT! continues to make some very high-tech, leading edge motorcycle clothing. Their complete clothing catalog has now been made available online and it’s huge, covering every single segment of motorcycle apparel that I can think of. The Off Track jacket and Dakar pants are just one example, and I can tell you that wearing both make me long for something like a new KLR650 just so I can wear them in style! UPDATE: (November, 2009) – The REV’IT! Off Track Jacket and Dakar Pants have now been replaced by the new REV’IT! Sand Jacket and REV’IT! Sand Pants combo for 2010! Manufacturer: REV’IT! List Price (2007): Jacket $449.99. Pants $299.99.